Vintage Train Birthday Party for my son Luca´s 3rd birthday party.With tons of sweet treats and decorations to match the theme! 6. Additional Party Labels customized as needed (no limit), in addition to pre-made labels already included in package (see below). Please include customization information in the notes section of the order. 7. Party Signs- Happy Birthday with child’s name, Welcome sign with child’s name, and additional party signs in addition to pre-made signs already included in package (see below) Please include customization information in the notes section of the order. Party Labels/Food Tags (flat and folded)- may be used to label foods or as place cards. How to make Vintage Train cookies! These vintage train cookies are super simple to make. Allyou need are some store bought Marie biscuits or similar. Top them off with fondant circles that match your colour scheme. The trains on top were printed with an edible printer. I loved the final look, especially because they were not hard to make at all. The cupcakes were vanilla cupcakes that I colored turquoise (since the colour scheme was red, turquoise and white). I then topped them with my vanilla buttercream frosting flavored with candly floss extract. On top of that I sprinkled them with alternating sanding sugar in blue and red. Each cupcake was decorated with Vintage Train flags that I made with white lollipop / cake pop sticks. I made so many things for this party and to be honest it was too much sweet things for the kids but that´s me. I get overexcited and then I make anything and everything that comes up in my head! LOL! See! Way too much… you can´t even see all of the things I made in the table above. The sad thing is that I dont have much photos of the day because I lost then on my laptop which crashed. However I hoped this post inspired you to create your own Vintage Train Party! For more birthday party inspiration, click here to see my Minnie Mouse party or this Disney Cars Party. 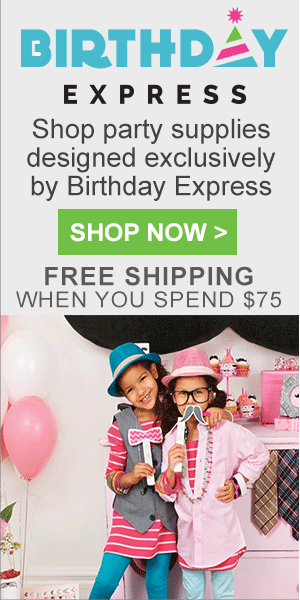 For even more inspiration, visit the Top Menu, click on CELEBRATE and scroll down to Birthday Parties. Some lovely ideas here. I’m thinking of doing a train party for my son’s 2nd birthday party later in the year – thanks for the inspiration!